Hello, and welcome to Uni-edit! I was born in Sydney, Australia, a country where English is the only official language, although over 200 languages are spoken. However my father was from Holland, and my mother was from Romania but raised in Chile, South America. I also have family relatives from the USA, Argentina, Hungary, Israel, Japan, Singapore and Cambodia. In my family life, as well as English I heard Dutch, Hungarian and Spanish everyday. So the challenges of navigating foreign languages was natural for me, a part of life. I've always had a passion for sharing and passing on knowledge, for teaching. At university I graduated from engineering and from commerce. I wrote my thesis on knowledge management. and worked as a teacher of maths and sciences for over 10 years. Interested in languages, I have studied Latin, Indonesian, Japanese, Spanish, Italian, Mandarin, Thai and Filipino. I lived in Japan for 2 years in Kochi and Kobe, where I studied Japanese and taught English. Also, I lived in Taiwan for 7 years, where I studied Mandarin. Being particularly interested in the writing system, I studied Mandarin and achieved fluency. Following teaching, I entered a career in management consulting. Most of my roles centered around process engineering, knowledge management, training and documentation. After 10 year or so, my skills in technical writing and document management peaked and I had authored many volumes, some of thousands of pages, for a variety of clients, including the University of New South Wales. During my career, I observed many times the communication barrier presented when highly skilled experts from the Chinese-speaking world need to collaborate with Western, English-speaking colleagues or management. I thought I could help to bridge this gap, and set out to Taiwan to study Mandarin and learn more about Chinese culture. I studied in Taipei at National Taiwan University (NTU) and at National Taiwan Normal University (NTNU). While at NTU, I met Professor Kang from the College of Engineering and began to edit the English of his research manuscripts, with a focus on clarifying the meaning. My many years of writing and editing experience coupled with background in engineering suited academic English editing and before long I was editing papers from his colleagues too. One of his colleagues required editing of a paper with strong chemistry, which was out of my domain. With his permission, I hired an expert in chemistry to work on that paper. 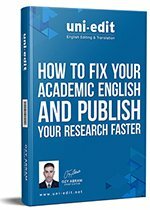 The formula for Uni-edit was born: strong native-speaking writing skills, subject-matter expertise case by case for each paper, a focus on clarifying meaning and of course trust between all the people involved. The company was formally registered with the Taiwan government soon after. I am proud to say that my original customers from NTU are still my good customers today, and my friends. Originally, in 2006 when Uni-edit started, I was the only Editor, and I enjoyed the close working relationship with my customer. However, I soon realized that my help was limited, by how much time I had. Soon, I began recruiting and training Editors from USA, UK Australia, and Canada. I used thorough testing before hiring new staff and performed quality control on all their work, so that each customer received a consistently high standard of English editing. Recruitment and training are still core processes at Uni-edit today that receive a lot of my time. With customers impressed with the editing results, some requested that we translate their articles into English. The demand increased and so I began recruiting a team of translators. In combination with the native-speaker Editors, the translation process produced superb results, suitable for submission to journals. Further, as some Japan customers, who were co-authors, wished to use the service, Uni-edit services became available globally. Bridging the communication gap still remains a primary goal of mine. Uni-edit needs to communicate complex requirements regarding editing or translation to technical language experts and move documents around the world securely and reliably. Our matured systems and processes allow this to happen daily without interruption. "Uni-edit are kind, trustworthy, and knowledgeable people who reliably deliver language services that meet my needs." You might notice that "kind" is right at the front. I aspire for my team to be kind to our customers and to each other. Thank you for taking time to read my profile and do contact me or my staff any time to discuss how we can work together. You might like to watch my introduction video.